Lock in a great price for Crowne Plaza Den Haag Promenade – rated 8.4 by recent guests! The hotel is beautifully decorated and the swimming pool is EXCELLENT! Nice rooms, very comfortable, got given a room with a balcony without asking for it. Good climate control as well. If you can, definitely visit the spa & welness area. The pool is lovely. Perfect experience through and through: fast and effective check in/check out, stylish and very comfortable room, windows were facing the street, but we slept in a perfect quiet. Accurate room service, clean and high quality bedding, proper king size bed. the nice touch from the hotel was a small cake for my husband's birthday on arrival since I mentioned it was a birthday weekend. The tram stop was 150 from the door which made every destination on our route easily accessible. We will be definitely coming back. The location of the hotel was excellent for my purpose. The design of the hotel is very nice. The bed was really comfortable and the room was quite big (for European standards). The Service was very friendly, we could even check in before the actual time. The room was clean and nice furnished. The location is next to two tram stations and in between Den Haag City and Scheveningen. The Spa is small but nice. It has a fully equipped gym. Staff (with one exception) was friendly and attentive. Restaurant served great food. Nice bar. Nice spa area. Large, spacious rooms. Very modern. Fabulous breakfast. Good free wifi connection. Friendly staff. Conveniently located by tram to the beach and the city centre. The breakfast was a bit expensive, but it was very Good with a lot of different options. Crowne Plaza Den Haag Promenade This rating is a reflection of how the property compares to the industry standard when it comes to price, facilities and services available. It's based on a self-evaluation by the property. Use this rating to help choose your stay! This 5-star hotel is located with-in a 5 minute drive from Schevening Beach and a 10-minute drive to the center of The Hague. Crowne Plaza Den Haag offers free WiFi, a spa and wellness center and an indoor heated swimming pool. Guests can benefit from the 24-hour breakfast service. Each modern room is air-conditioned.They feature a desk, seating area, mini-bar and flat-screen TV. All bathrooms are fitted with a shower, some of the rooms feature a bath. Breakfast is offered each morning in the restaurant or in your room. In the evenings a French and Mediterranean cuisine is served. The bar provides a wide range of drinks including cocktails. Crowne Plaza features a fitness center, sauna, steam bath and massages. There is a 24-hour front desk and laundry and dry cleaning services are available. 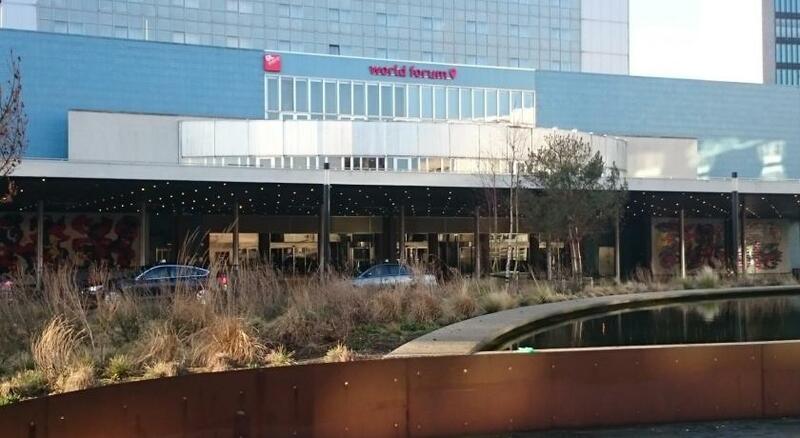 World Forum convention center is 1,800 feet from Crowne Plaza. The center of The Hague is also easy accessible by tram. The Hague Central Station and the A12 highway are 2.5 mi away. When would you like to stay at Crowne Plaza Den Haag Promenade? Superior rooms are located in the Promenade wing and have spacious balconies and provide a view over either the park or the city of The Hague. The rooms of 85 ft² are equipped with WiFi, a spacious bathroom with a walk in shower, air conditioning, coffee and tea making facilities, fridge, spacious desk and safe and a separate seating area. Public parking is available on site (reservation is not needed) and costs EUR 19.50 per day. The spacious and luxurious Club rooms in the style of Royal Blue are located in the Apollo wing of the hotel. These 32m2 rooms have a view over the park or the city. The rooms are equipped with a king size bed and spacious bathroom, including a bath and separate shower. In addition, all rooms are equipped with free WiFi, air conditioning, coffee and tea making facilities, spacious desk, safe and a separate seating area. All rooms are completely nonsmoking. In addition, with a supplement you can use wired internet and connect with various movie channels and World TV. The spacious and luxurious Executive rooms in the style of Royal Blue are located in the Apollo wing. The rooms with a size of 28m2 are provided with twin beds, a spacious bathroom equipped with a bath and separate shower. In addition, all rooms are provided with air conditioning, coffee and tea making facilities, fridge, spacious desk, safe and a separate seating area. All rooms are completely nonsmoking. WiFi is free throughout the hotel. In addition, with a supplement you can use wired internet and connect with various movie channels and World TV. This suite features a seating area, bathrobe and fireplace. This suite has a seating area, bathrobe and flat-screen TV. Enjoy our pool, fitness and swimming pool or have a run in the park which is located next to the hotel. The hotel is also nearby Scheveningen where you can have a nice walk on the beach. House Rules Crowne Plaza Den Haag Promenade takes special requests – add in the next step! Any additional older children or adults are charged EUR 32.50 per night for extra beds. ATM card Crowne Plaza Den Haag Promenade accepts these cards and reserves the right to temporarily hold an amount prior to arrival. Crowne Plaza Den Haag Promenade accepts these cards and reserves the right to temporarily hold an amount prior to arrival. We have a limited number of roll-away beds available. Roll-away beds are available upon request for a supplement (see Hotel Policies for details). Children can stay for free in the room of their parents. The maximum number of people in the room is 3. Costs for pets are 49 euro per pet per day. Please note that when booking more than 9 rooms, different policies and additional supplements may apply. Please contact the property for more information. The hotel it is situated half way between the city centre and the beach, next to a tram stop, which is very convenient for going to town or to the beach. However, the surroundings are not much. It is situated right across a petrol station on an busy crossroad. We were upgraded to a Club Room free of charge. The swimming pool was excellent, everything was clean and new. Breakfast was great. The staff were very helpful. Cleaniness wasn’t 100%. Hair in the bath. Check-in staff who acted to prioritize me when a customer jumped queue to be served. Thank you you made me feel a valued customer. Remote from center and from sea, neither here nor there. Aging hotel. Excellent place to stay, specially if you are going to the World Forum. Great installations, with sauna, swimming pool and gym. Great breakfast also. I did not like the bar decor, but this is personal opinion and hardly a negative point. Upgrade to Suite, very spacious, free mini bar, extremely nice bed and bathroom. I had a bit of a mismatch in expectations, but both Booking.com and the hotel assistant front office manager dealt with the issue promptly! Therefore a negative experience turned into a satisfactory experience. This was an upgraded room after a previous poor experience. This room was truly comfortable, warm, quiet and could not be faulted. The staff we also extremely helpful.